iPad is here and so is the iBooks app. The first time you open the App Store app on your iPad, you’ll automatically be prompted and asked if you want to install the iBooks application on your iPad. From there you can browse your Library (where you can view and read your book collection) and visit the built in book Store (where you can sample and buy digital/e-books). 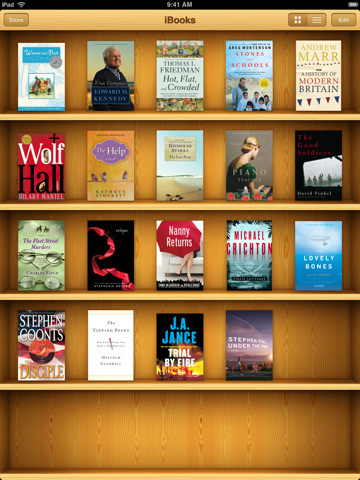 Browse your Library of books in a virtual wooden bookshelf with your books placed presented with their covers. You can also view books in list view which show the book title, author(s) and book categories. You can delete books from your Library if you wish. 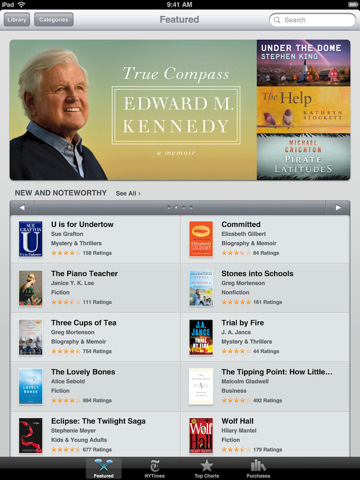 iBooks also comes with a great looking and powerful book reader using a natural book design. Adjusting book content is easy to do. You can change the brightness of the display, and change the font sizes. iBook gives you 5 font families to choose from: Baskerville, Cochin, Palatino, Times New Roman, and Verdana. You can search the book contents by keyword and easily jump to any chapter using the table of contents. Tapping and holding on book text brings up a menu where you can find words in the dictionary, search for more instances of the phrase, bookmark the page, or just copy the text. The dictionary and bookmarking features are quite useful. There is a draggable page scroller on the bottom of the page that indicates what page you are on, and and how many pages of the current chapter are left. iBooks remembers your reading position and reopens to the exact same place when you reopen the app. The Store can be accessed by flipping the Library over to its opposite side. Very similar to the App Store, the iBooks Store lets you browse books by genre, download samples and buy eBooks with ease. To get started you can grab some free sample chapters of any book. There is a Free Books section, Bestselling Bios, Books Into Movies, and a Build Your Library Section. iBooks average prices are $9.99 and there is a pre-order section as well. You can drop any eBooks that are in ePub format to your iTunes library and they will automatically get synced with your iPad and show up in your iBooks Library. If you have PDF books, help files or documentation files (for example the iPad User Guide) that you’d like to have in iBooks you just have to convert them into the .epub file format. One of the most powerful and easy to use softwares for converting files into ePub format is called Calibre. As a free software download, you can use Calibre to update the Meta information of your PDF files automatically and convert files individually or in bulk. Once done you just have to drag and drop the newly created *.epub files into iTunes and sync. You can find lots of DRM-free EPUB books to downlaod at various websites such as Google Books. A hidden feature of the iBooks app, or the iPad in general is the ability to read text aloud. You can invert the colors to be White on Black in the Accessibility settings as well if you like. You can enble this feature called VoiceOver to have the iPad read books to you aloud, which feels like listening to an audio book read by a female robot. Go to Settings>General>Accessibility>VoiceOver and toggle it to the on position. You then have to use finger gestures as commands to navigate around. Here is a list of VoiceOver commands for the iPad and some of the ones you’ll need for iBooks are highlighted. 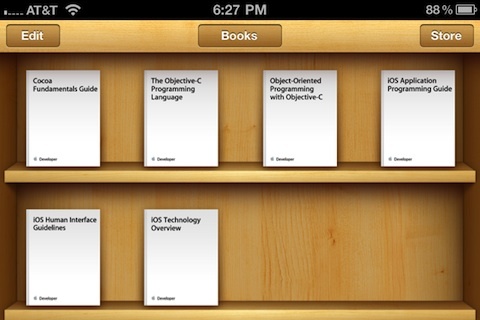 Overall, iBooks is a great free app and works quite well. The only issue we have so far is the slightly overweight nature of the iPad itself which can be eased if you have a dock or just place the iPad on your lap while reading on the iBooks app. Update: iBooks has just been updated with the ability to tap images to view them in greater detail, embedded audio and video within books and enhanced PDF viewing. AppSafari review of iBooks was written by Joe Seifi on April 4th, 2010 and categorized under App Store, Books, iPad apps, Productivity, Reading, Utilities. Page viewed 7412 times, 2 so far today. Need help on using these apps? Please read the Help Page.